I think bibcursed might actually qualify as an office application, in the same way sc and slsc are spreadsheets, and jed and textadept are word processors. 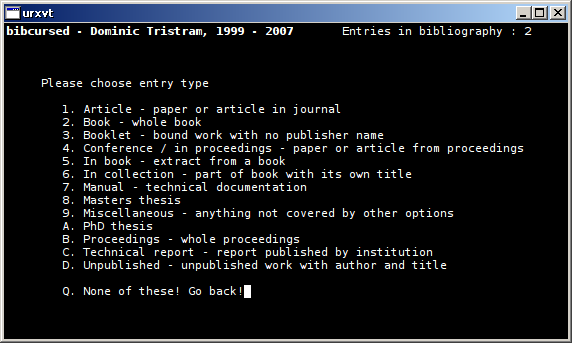 bibcursed manages and edits BibTeX bibliography files, and does it through a series of menus and a captive interface. I’ve used some bibliography tools in the past, and even some reference management sites or plugins, but they were usually browser based, and quite taxing on single-core machines. That’s the way things are going, to be honest. Finding bibcursed now makes me wish I had known about BibTeX a few years ago. It probably could have saved me a little time on more than one university project. Getting back to bibcursed specifically, everything is arranged through the startup menu, with options to search, change and add as you see fit. 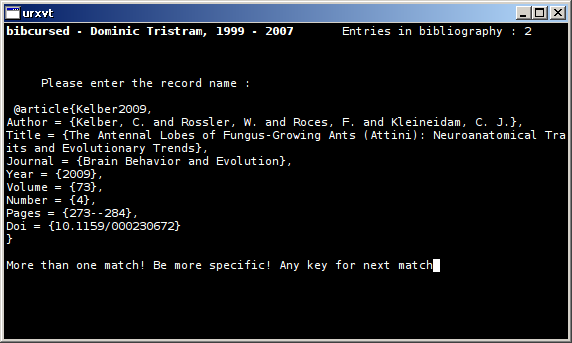 bibcursed can’t do much unless you are ready to work with a .bib file, and the one you see above was chosen at random from the vast information repository we call The Internet. No color, and controls are very simple, but given that bibcursed is more functional than frilly, I find no fault with that. Onboard help is a bonus, and I should mention that bibcursed gave me no grief for very small terminals or very large ones. I don’t have any context for using bibcursed aside from this brief adventure. But should the opportunity arise in the future, I should like to give it a try, and see how it behaves in a real-world situation. This entry was posted in Linux and tagged bibliography, management, reference on 2014/12/18 by K.Mandla.